Bill Littlefield (NPR's Only a Game) presents the second installment in the Library of America series devoted to classic American sportswriters, a defintive collector’s edition of the pathbreaking writer who invented the long-form sports story. 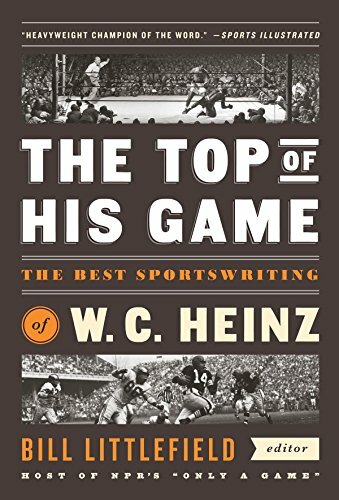 Like his friend and admirer Red Smith, W. C. Heinz (1915–2008) was one of the most distinctive and influential sportswriters of the last century. Though he began his career as a newspaper reporter, Heinz soon moved beyond the confines of the daily column, turning freelance and becoming the first sportwriter to make his living writing for magazines. In doing so he effectively invented the long-form sports story, perfecting a style that paved the way for the New Journalism of the 1960s. His profiles of the top athletes of his day still feel remarkably current, written with a freshness of perception, a gift for characterization, and a finely tuned ear for dialogue. Jimmy Breslin named Heinz’s “Brownsville Bum”—a brief life of Al “Bummy” Davis, Brooklyn street tough and onetime welterweight champion of the world—“the greatest magazine sports story I’ve ever read, bar none.” His spare and powerful 1949 column, “Death of a Race Horse,” has been called a literary classic, a work of clarity and precision comparable to Hemingway at his best. Now, for this essential writer’s centennial, Bill Littlefield, the host of NPR’s Only A Game, presents the essential Heinz: thirty-eight columns, profiles, and memoirs from the author’s personal archive, including eighteen pieces never collected during his lifetime. Though Heinz’s great passion was boxing—the golden era of Rocky Graziano, Floyd Patterson, and Sugar Ray Robinson—his interests extended to the wide world of sports, with indelible profiles of baseball players (Babe Ruth, Joe DiMaggio), jockeys (George Woolf, Eddie Arcaro), hockey players, football coaches, scouts and trainers and rodeo riders. If you have any questions about this product by Library of America, contact us by completing and submitting the form below. If you are looking for a specif part number, please include it with your message.